Good data on the exact size of the middle class are hard to come by, but it remains small across most parts of the continent. The Pew Research Centre, an American outfit, reckons that just 6% of Africans qualify as middle class, which it defines as those earning $10-$20 a day. 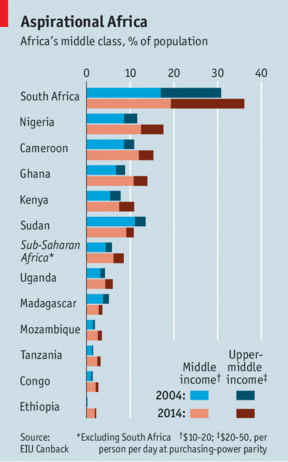 On this measure the number of middle-income earners in Africa barely changed in the decade to 2011. …… Unlike Asia, Africa has failed to develop industries that generate lots of employment and pay good wages. Only a few countries manufacture very much, largely because national markets are small and barriers to trading within Africa are huge. Most people who leave the countryside move into labour-intensive but not very productive jobs such as trading in markets. John Page, also of Brookings, reckons that such jobs are on average only about twice as productive as the ones that many left behind.